There's nothing truly better than the delicious smell of stir fried vegetables and meats cooking over the burner. As a child in an Asian-American family, this is something that I was lucky to experience regularly. However, with good food comes great quality cookware. We found some of the best wok spatulas on the market and tested them for your viewing pleasure. Traditional Chinese cooking uses metal. Woks come in all shapes and sizes. If you have a deep wok, make sure to get a longer wok spatula. Some wok spatulas will be made from scratch resistant material. This clearly makes life easier for all. When it comes to cooking with a wok, you need the proper tools to ensure your stir-frying is cooking properly. If you cook for a large family or have a commercial-grade wok, this is the perfect wok spatula for you. Coming in at a hefty 20 inches long, these spatulas are perfect for working with huge woks. Have you ever cooked with a spatula and it was just too dang short and your hands start to pick up hot oil? You definitely will not experience this issue with these. 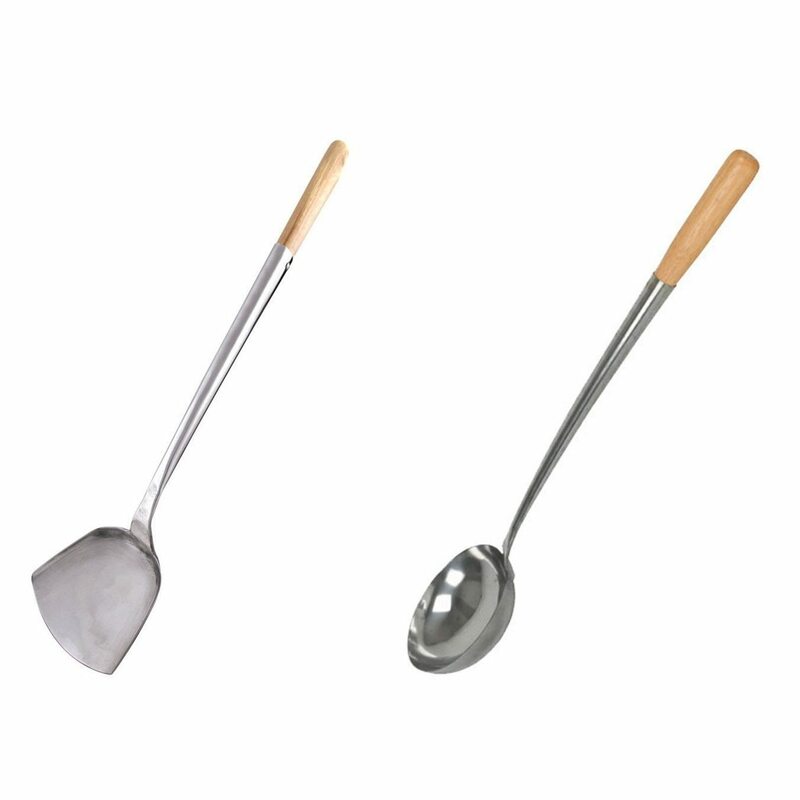 This kit includes a shovel-like spatula and ladle perfect for spooning in sauces during heavy stir fry cooking. Plus, you can put these utensils in the dishwasher for easy cleaning, though we do recommend hand-washing them. Overall, these heavy-duty spatulas by the Wok Shop are the top of the line tools for your stir fry and wok cooking. If you're looking for the best wok spatulas that will take your wok cooking to the next level, these are perfect for you. Not only are these made from quality and sturdy stainless steel, they're also great for those who are just getting into wok cooking at home. With 18 inches of length, these are perfect for a deeper wok but not necessarily commercial grade. They will work well with these flat bottomed woks without scraping or scratching the bottom. The kit includes a spatula and ladle so you can use one for sauces and one for moving heavy vegetables and meats. Also, each tool is equipped with a durable wooden handle, keeping your hand protected from burning. Clean up is a breeze since they are dishwasher safe. If you're looking to cook delicious stir-fried foods with a wok that has a teflon or a non-scratch proof surface, you're definitely going to want to cook with a wooden wok. These handy wooden tools are some of the best wooden wok spatulas on the market for cooking Asian cuisine. This beautiful wooden set comes with a spatula and ladle for your cooking convenience. Made from some of the finest beech wood, this spatula is extremely sturdy. Also, the best part of this spatula is that it will not scratch the surface of ceramic woks, stainless steel woks, or coated or seasoned woks. The spatulas are also ergonomically designed so your hands and arms won't tire when cooking heavy foods. 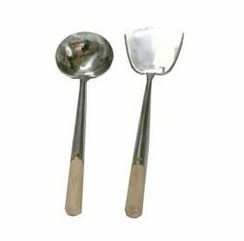 We do not recommend putting wooden utensils in the dishwasher since the excessive heat and water can warp the spatula and ladle. All in all, we love these wooden wok spatulas for their price, efficiency, quality, and overall feel. Want to feel like a professional chef at home? Well, you're in for a treat. This professional grade wok turner is perfect for you if you want to up your at-home Asian cooking game. FAAY products boast a 100% all natural and non-toxic product that will surely impress your cooking standards. Coming in at 13.5 inches long, it is great for making smaller meals at home. 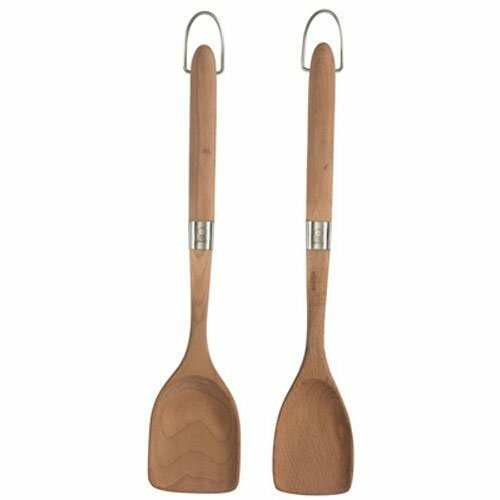 With a sturdy teak wood construction, the spatula itself is eco-friendly and will not bend or break easily when cooking. Also, the design is perfectly ergonomic, so you don't have to worry about hand cramping or arm tension when cooking. Plus, the teak wood spatulas will never damage your expensive cook wear. The soft wood and smooth designs will glide with easy when working with the wok. Ultimately, you will be very pleased with this addition to your kitchen arsenal. This tool will make cooking your favorite Asian dishes at home easy and fun. For those of you who want to go the more traditional route, this is the wok spatula for you. Coming in at 14.5 inches, this is enough length that will keep your hands from being singed when cooking at high temperatures. First off, we love the bamboo handle on this spatula. Bamboo is the perfect wood for kitchenware since it is virtually waterproof and extremely durable. Plus, the bamboo itself is very light weight, making the spatula light and easy to use. When it comes to cleaning the spatula, you can easily hand wash with soap and water. Ultimately, this is an excellent traditional wok spatula. Whether you're cooking up traditional Chinese cuisine or juust want a little extra distance when cooking with yyour wok, you'll be happy with this addition to your kitchen tools. If you're looking for a high quality product that will give you delicious stir-fry dishes at home, look no further. The DESLON wok spatula is the perfect turner for making delicious Asian cuisine. Made from stainless steel, the 15 inch long spatula is excellent for cooking in very deep woks. The handle is also hollow making it heat resistant. Plus, the hollow construction of the spatula allows it to be really light at only 240g. This is great for those who don't need an extra workout while stir-frying their favorite Asian dishes. Also, the spatula is dishwasher safe, making clean up easy breezy. In the end, this excellent culinary innovation is a definite must-have in your kitchen arsenal. We highly recommend it for those who have steel woks. Want the perfect accompaniment to your favorite wok? Well, you've found the right product. This stainless steel Christopher Kimball wok spatula is an excellent tool for cooking up your favorite stir-fry dishes at home. Constructed from stainless steel, the long and light-weight design is great for getting to the bottom of deep woks. Since most traditional Chinese cooking requires really high heats, it's essential to get a spatula that's long enough so your hands do not burn. Even though it's on the shorter side compared to the rest of the spatulas, it's makes up for it in featherweight at only 6 ounces. Overall, we love this wok spatula. 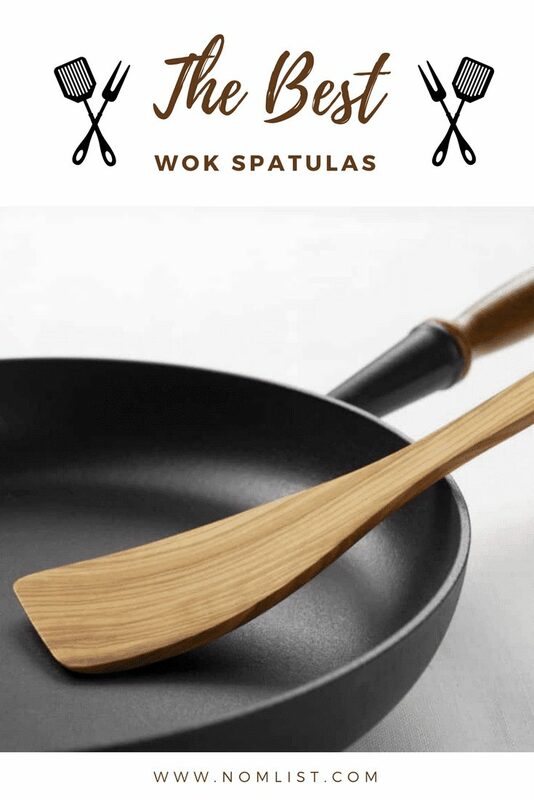 It's an excellent starter spatula if your'e just getting into wok cooking. Have you ever wondered what your life would be like with a wok spatula? It's specific, but vital. Wok spatulas can really make or break your at-home asian cooking because of their length and ergonomic design. When it comes to the design of this Cuisipro Silicon wok turner perfection doesn't justify its description. First off, we love the silicone construction of this spatula. The silicone has high-heat resistance up to 572 degrees. Also, the ergonomic design makes handling the spatula easy and pain-free. Ultimately, we know you'll love this silicone wok turner. It's a great way to dip your toes into Asian cooking at home. Previous articleThe Top 10 Best Paella Pans and What to Serve with Paella!